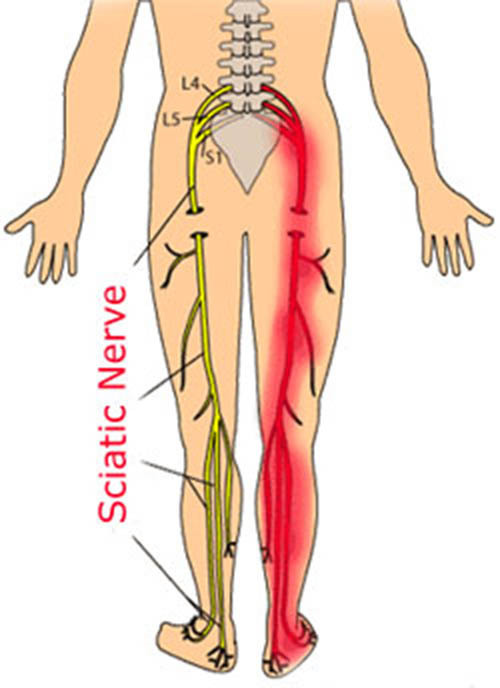 The sciatic nerve is the longest nerve in the body, beginning from nerve roots in the lumbar part of the spinal cord (lower part of the back) and extending through the buttock area to send nerve endings down to the legs. A mechanical compression of the sciatic nerve as a result of spondylolisthesis, arthritis or spinal stenosis may also cause the pain. There is no danger of paralysis because the spinal cord is not present in the lower (lumbar) spine. Over time, the nerve usually heals itself and pain gradually dissipates, given proper rest and care. Depending on the severity of pain, aspirin or ibuprofen, muscle relaxants or cortisone injections may be prescribed, along with a recommendation of regular exercise which helps ease inflammation. Gentle cold or hot compresses can also offer relief for aching muscles. Sciatica will usually get better on its own, within a few days, or possibly a few weeks. If possible, stay at work and try to be active. If the pain forces you to rest, know that rest is not a good treatment for sciatica. Try to limit time spent in bed. Simple painkillers, including paracetamol or ibuprofen, may come in handy. Do not necessarily put additional strain on your back. If the symptoms are present for more than a few days, consider seeing a physiotherapist, chiropractor or osteopath. An epidural injection into the spine may be helpful in cases of severe and disabling pain. Complications arise in a minority of cases. Your doctor may suggest surgery if sciatica does not settle or complications occur. Most commonly, symptoms of sciatica pain decrease after a few weeks or months with nonsurgical treatment. Depending on the nature of the diagnosed reason for sciatica, your doctor may recommend different treatment approaches. The root cause of sciatica needs to be eliminated to cure sciatica symptoms. Hot packs work by increasing blood flow (to get more blood in the area of application to generate more oxygen and drive more nutrients into the affected area). OTC medications like Aspirin or ibuprofen belong to the Non-Steroidal Anti-Inflammatory group of drugs. They act as painkillers and are helpful with reducing inflammation. Prescription medications are stronger and prescribed in cases of chronic conditions or severe pain. These are muscle relaxants and antidepressants. Strengthening exercises are very important in the management of low back pain. They are designed to strengthen the “core” or trunk muscles. Two common forms of strengthening exercises to treat sciatica are McKenzie exercises and Dynamic Lumbar Stabilization exercises. These exercises must be done regularly (typically two times daily) and correctly to be effective, so you need to make them a part of your daily routine. The duration of these exercises is progressive starting from short periods and low reps at the start and progressing to more time and more repetitions. Sciatica affects as many as 40% of people during their lives. Daily stretching and strengthening exercises may help to prevent flare-ups. A sciatica patient is also likely to receive a complimentary diet program during the therapy sessions to help them accelerate the body’s recovery. Microdiscectomy is a microscopic surgery performed through a very small incision with tiny instruments to remove either the whole or parts of a herniated disc. Endoscopic Discectomy involves a tube-like structure that is inserted into the body. Recovery from endoscopic discectomy takes longer than microscopic. Percutaneous Discectomy is a way to remove a herniated disc from the back bone. A surgeon may decide to remove the entire disc or only a part of it. Laser Discectomy involves lasers to remove the herniated disk. Laser Discectomy is the most recent development in surgical treatments that are available for sciatica. Lumbar laminectomy (open decompression) is offered to those patients who suffer from lumbar spinal stenosis that causes sciatica pain that waxes and wanes over many years. After this procedure, around 70% to 80% of patients typically experience relief from their sciatic nerve pain. TWO legs involved with sciatica ?